Patna, (BiharTimes) In another mega scam in Bihar , private nursing homes removed uterus of more than 16,000 poor women to swindle crores of insurance money under Rashtriya Swasthya Bima Yojana, an ambitious Project of govt. of India to financially help women of below poverty line during hospitalization. Poor women mostly from rural areas were advised immediate Uterus removal as they might become victim of grave medical complications like cancer. The patients believing doctors immediately get ready for the operation. The numerous cases of forced surgery helped nursing homes to swindle insurance amount with the help of insurance company officials and state govt. officials. “The removal of Uterus on thousands of women of all age group including even minors is a serious human rights violation not to talk of medical ethics. The poor ladies got into the trap of middlemen and nursing home owners who has virtually converted removal of Uterus into a full-fledged money minting industry” said Sudhansu Kumar, a Mukhia of Naya Nagar Panchayat of Samastipur. The cases of performing hysterectomy on even minor girls and Males were reported from some districts when initial probe was done. Scamsters used fictitious names to claim insurance money from Insurance Companies under the aegis of the scheme. Sources from Samastipur district said that not less than 12 cases of hysterectomy on male patients were also brought to the notice. According to District Magistrate’s version at least about 100 cases were found where surgery had not taken place at all. He also organized a camp in his district to evaluate cases with the help of ultrasound. “Many small nursing homes without even a proper operation theatre got several lakhs in lieu of operations. Virtually the whole exercise turned into an organized scam in connivance with govt. officials, nursing homes and insurance companies” told govt. sources. The initial probe was initiated in Samastipur when the insurance company, ICICI Lombard, raised an alarm after receiving a bill of a whopping several crores from the 16 nursing homes. A claim of Rs. 10,000 can be made for a single hysterectomy. The highest number of hysterectomy was performed in Samastipur district followed by Madhubani. Detailed information from Nalanda and Vaishali are still awaited’. About 5000 hysterectomy was conducted only in Samastipur district. The major amount disbursed to the nursing homes are in the Nalanda district, incidently the home district of Chief Minister Nitish Kumar where at least 24.2 crores were paid in the year 2010-11 as hospitalization cost to 65 nursing homes and hospital. Other districts where major disbursement was made are Vaishali 10.2 crores, Samastipur 6.9 Crores and Muzaffarpur 5.9 crores and so on. The matter also found resonance in the state assembly when opposition members charged the involvement of state govt. officials in the scam. The speaker Uday Narayan Chaudhary ordered a house committee probe into the whole affair where as opposition was demanding immediate CBI probe. The state Labour Resources Minister Janardhan Singh Sigriwal, however, denied the charges of corruption and said there were no irregularities in uterus removal of women in the state. He further said that uteruses of 16,765 women were removed in 11 districts of the state. RJD legislator Bhai Birendra accused Chief Minister Nitish Kumar's government of being hand in glove in the loot of the money of Rashtriya Swasthya Bima Yojana. He said that the govt. had looted the money of the lowest rung of the society and played with their health that would have a very serious future implication. Large scale surgery on ultra poor just to make money is a crime against humanity. 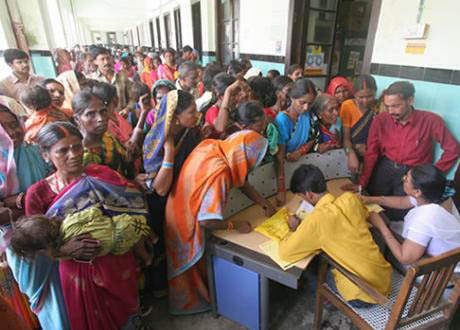 In 2008, Government of India launched the Rashtriya Swasthya Bima Yojna (RSBY) insurance scheme for the women belonging to BPL families. They got economic shock due to hospitalization for the treatment of severe aliment. Under the scheme, the beneficiary had to pay a registration fee of Rs.30 and that covered the health insurance for Rs.30,000 and could ensure medical treatment in the approved hospitals. The whole programme went hey wire in the state owing to poor monitoring system or it deliberately became planned move to make money taking benefits of loop holes in the scheme. Many poor ladies had to lose their womb.